Medical assistants are in high demand all across the nation, but that need is especially acute in Georgia, where employment of medical assistants is expected to grow by an impressive 49.9 percent over the next several years. With over two dozen accredited medical assisting programs in the state, it's safe to say that Georgia is ready to train medical assistants to meet the demand. Learn what aspiring students can expect from not only their education, but from the career they will embark on when the education or training is complete. The medical field is growing and the need for qualified medical professionals is growing along with it. Earning a degree or certificate in medical assisting is a good place to start in this rewarding industry. To help you find the best program for your needs, we did the research for you. We looked at class sizes, the cost of tuition, student services available and more to bring you our list of some of the Top Colleges for Medical Assisting in Georgia for 2017. Beginning a career as a medical assistant first requires a proper education, which is why North Georgia Technical College offers a degree in medical assisting. Employers who hire graduates from this program have expressed up to a 98 percent satisfaction rate with their new workers. Graduates from any NGTC program express a strong work ethic and dedication to their field of choice that is highly appealing to most employers, giving students the competitive edge needed for job placement in the current employment market. Students can further help facilitate their success by meeting with one of NGTC’s career counselors to develop their interviewing skills. At 54 credit hours, the medical assisting program offered at Central Georgia Technical College is a quick and affordable route to an entry level position as a medical assistant. Students will work with professionals who have spent several years working in their respective fields, and encourage both theoretical learning as well has hands-on learning methods. One of the added benefits of learning at CGTC is its small class sizes, which ensure students will have a personalized learning experience and not have to worry about being overlooked by their professor. Students may also find the quickest and cheapest path to graduation by meeting with a CGTC academic advisor. Albany Technical College offers a degree in medical assisting that consists of 70 credit hours, allowing students to work towards job placement after just over two years of learning. Over the previous five years, 100 percent of graduates from Albany Tech’s medical assisting program have been placed into jobs, and 100 percent of responding employers have expressed satisfaction with these workers’ competency. One of the keys to Albany Tech’s success with its programs is in its focus on their students; Albany Tech class sizes are small, allowing for heightened attention to individual learners. Albany Tech also utilizes on-campus events and student organizations to create a productive and integrated academic community. The medical assisting program offered at Georgia Northwestern Technical College is an excellent stepping stone for students interested in achieving an entry-level position as a medical assistant in a medical clinic or office. The medical assisting program consists of 54 credits, allowing students to complete their program in as few as two years. GNTC helps to ensure post-graduation job placement by providing its students with career services, helping them to develop their resume and learn how to answer common interview questions. While tuition is low at GNTC, students may further supplement their academic payments by applying for one of GNTC’s financial aid packages. Lanier Technical College has developed their associate of applied science degree in medical assisting to prepare students to start in an entry-level position as a medical assistant in a hospital, clinic, or doctor’s office. Studying under this program helps students to develop their skills in understanding the human body, work with patients, and process medical and insurance billing. Lanier Tech’s courses often blend traditional in-class learning with applied learning experiences, giving students the most well rounded education possible. Students enrolled at Lanier Tech may also wish to spend their free time becoming more integrated in their academic community by completing community service or joining a student club. Students enrolled at Bainbridge State College can begin working towards a career as a medical assistant by working through a 60-credit program for medical assisting. This program is designed to be completed in approximately two years, but Bainbridge offers winter and summer courses to help students complete their course work as quickly as they are able. Bainbridge offers both associate of art and science degrees, which allow for transfer into a bachelor’s program, as well as associate of applied science degrees, which are designed to get students employed right out of college. A wide variety of degree emphases are available, allowing students to find the program that will best fit their career aspirations. The first step to achieving a fulfilling career as a medical assistant is to complete a medical assisting program at a school like Chattahoochee Technical College. Chattahoochee Tech designs each of its programs to properly prepare students for career or academic advancement. One of the most beneficial aspects of learning at Chattahoochee Tech is that students don't have to pay the high tuition cost common to most four-year schools. Students will also be able to select from a wide variety of degree emphases, any of which will be beneficial for personal betterment. Chattahoochee Tech provides any eligible students with financial aid coverage in the form of grants, scholarships, and federal aid packages. 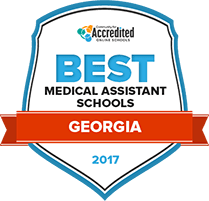 There are currently over two dozen accredited medical assisting schools or programs in Georgia. Choosing between those options can be a challenge, but this search tool makes it easier by helping aspiring students explore the possibilities. How does Georgia define "medical assistant"? Does Georgia require medical assistant certification? Does Georgia require formal training or education? Formal education or training is not required to become a medical assistant in Georgia; however, most employers prefer to hire someone who has completed a training program, earned a diploma or degree, or have become certified by a national certifying agency. Certifying agencies do require formal training. Are there additional certification requirements? Those who have chosen to become certified must complete certain requirements to keep their certification in good standing. This might include continuing education or a certain number of experience hours. Certification must typically be renewed every five years. Are there tasks outside the scope of medical assistants in Georgia? Physicians, registered nurses, advanced practice nurses and similar medical professionals can delegate certain tasks to medical assistants; however, they cannot delegate tasks for which the medical assistant has not received proper training. Wonder how salaries stack up against the rest of the nation? The following chart compares the average salaries of Georgia medical assistants with the average of those throughout the nation. What a medical assistant makes can vary depending upon numerous factors, including geographic location. Here's a sampling of what medical assistants may expect to see on their paychecks, depending upon the area in which they practice. Those who choose to work as medical assistants in Georgia should have no trouble landing a job; in fact, Projections Central expects a whopping 49.9 percent job growth for medical assistants between 2012 and 2022. The chart below offers more details about Georgia's robust job growth. There are currently around 25 accredited medical assisting schools or programs available to students in the state of Georgia. The following three spotlight schools provide students with a glimpse of what they might expect from any of the accredited programs in the state. This school offers numerous programs under the umbrella of health science, which means that medical assisting students can also take courses that further their specializations, such as those in phlebotomy or radiology. The medical assisting diploma program can be completed with 61 credit hours. Courses focus on practical patient care as well as office management. Part of the technical college system of Georgia, WGTC offers medical assisting courses in various locations in a seven-county area. Students can obtain a diploma in medical assisting in 12 to 18 months. The program prepares students to sit for national certifying examinations upon graduation. An in-depth description of the various licensed medical providers in the state and some assistant positions. This division of the American Association of Medical Assistants has 10 chapters throughout the state of Georgia. Discussed the scope of several states for medical assistants, including Georgia.